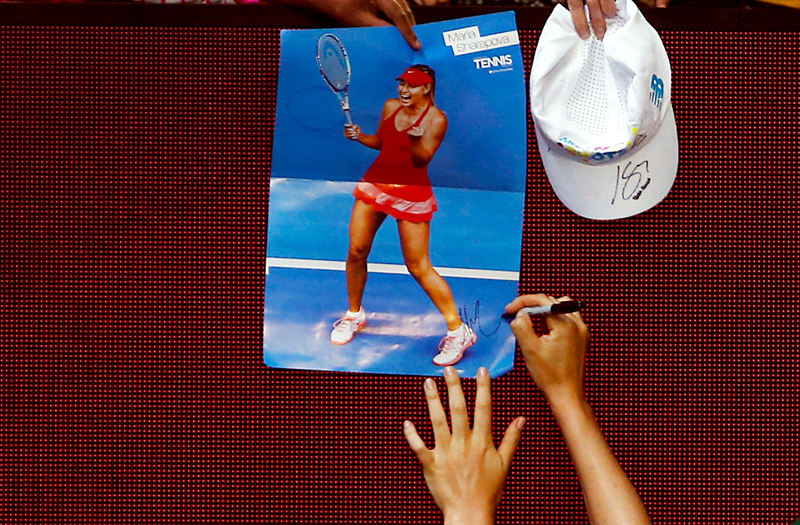 Maria Sharapova signs autographs, Melbourne Park, Australia, Jan. 22, 2016. Russian tennis star Maria Sharapova was granted a wildcard permitting her to enter the main draw of the tennis tournament in Rome, Internazionali BNL D'Italia, which offers $2.77 million in prize money up for grabs, the tournament’s organizers announced on March 1. The 29-year-old Sharapova, who is the three-time Internazionali BNL D'Italia champion grabbing the most recent title in Rome in 2015, earlier picked up wildcards for the tennis tournaments in Stuttgart and Madrid as she is making her return to the circle of the WTA (Women Tennis Association). The tournament in Italy, scheduled to be held between May 15 and 21, will be Sharapova’s third this year following Stuttgart and Madrid. Currently serving a provisional suspension, Sharapova is set to make her comeback following a doping ban on April 26 at the tennis tournament in Stuttgart. The tennis player has been serving a two-year suspension for the violation of anti-doping regulations since Jan. 26, 2016. However, the Swiss-based Court of Arbitration for Sport ruled on Oct. 4, 2016 to reduce her suspension term from 24 to 15 months.